A British-born Muslim convert killed four people and injured at least 50 in London Wednesday after a car rammed into pedestrians and the attacker stabbed a policeman close to the Houses of Parliament. Three thousand five hundred witnesses have been contacted, according to police, including 1,000 on Westminster Bridge and 2,500 from Parliament. Sixteen searches have been concluded with five continuing, according to police. The searches took place in the West Midlands and North West. Some 2,700 items have been seized including computer data. Leslie Rhodes (75) was named by police as the fourth victim of the attack. From Streatham in South London, Rhodes died in hospital on Thursday night after life support was withdrawn as a result of injuries he sustained during the attack. Nine people are in custody following police raids in London and Birmingham, Assistant Commissioner for Specialist Operations Mark Rowley told reporters at a press conference this morning. Rowley said police were trying to establish if the attacker acted alone. He revealed the birth name of the attacker, Khalid Masood, as Adrian Russell Ajao. The death toll from Wednesday’s attack in London stands at five after a fourth victim of attacker Khalid Masood, who also died, was confirmed late Thursday. Police identified British-born Masood, 52, yesterday as the attacker. Islamic State (IS, formerly ISIS/ISIL) claimed responsibility for the attack which left around 40 people injured. A US government source told Reuters that the Westminster attacker, Khalid Masood, associated with people who had an interest in joining jihadist groups abroad. "The people he was hanging out with did include people suspected of having an interest in travelling to join jihadi groups overseas, but the attacker himself never did so," the unnamed source said. Police say a man injured in Wednesday's Westminster terrorist attack has died. London’s Metropolitan police confirmed that a 75-year-old man died after his life support was withdrawn. This brings to four the number of people who have died in the attack by Khalid Masood. Westminster police have confirmed via Twitter that a package was found but said it “was not suspicious” and that all cordons are being lifted. 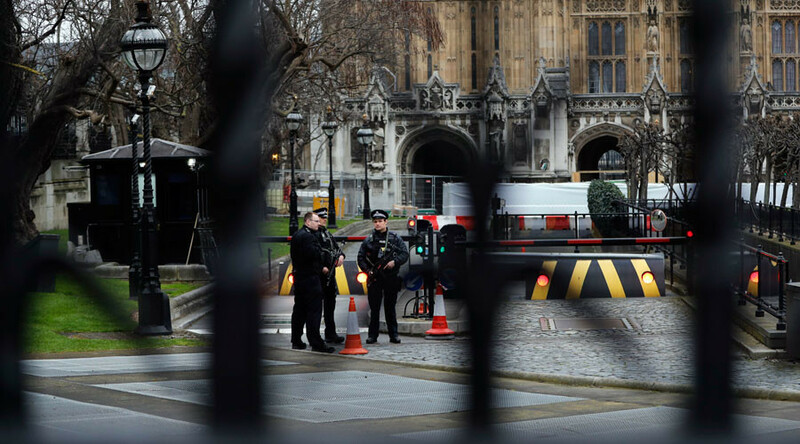 London police say they’re looking into a suspect package found near Buckingham Palace, which is located close to the scene of Wednesday’s terrorist attack in Westminster.